As a graduate student in the 1980s, Bruce Yankner wondered what if cancer-causing genes switched on in non-dividing neurons of the brain. Rather than form a tumor, would those genes cause neurons to degenerate? To explore such what-ifs, Yankner spent his days tinkering with neural cells, using viruses to insert various mutant genes and study their effects. In a stroke of luck, one of Yankner’s insertions encoded a precursor to a protein called amyloid. 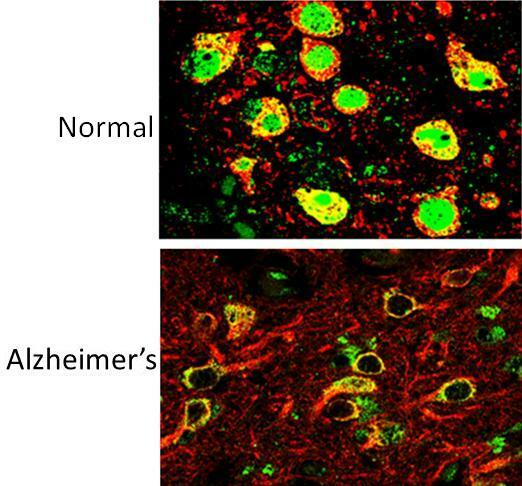 Those experiments and later ones from Yankner’s own lab showed definitively that high concentrations of amyloid, as found in the brains of people with Alzheimer’s disease, are toxic to neural cells . The discovery set Yankner on a career path to study normal changes in the aging human brain and their connection to neurodegenerative diseases. At Harvard Medical School, Boston, Yankner and his colleague George Church are now recipients of an NIH Director’s 2016 Transformative Research Award to apply what they’ve learned about the aging brain to study changes in the brains of younger people with schizophrenia and bipolar disorder, two poorly understood psychiatric disorders. Caption: The REST protein (green) is dormant in young people but switches on in the nucleus of normal aging human neurons (top), apparently providing protection against age-related stresses, including abnormal proteins associated with neurodegenerative diseases. REST is lost in neuron nuclei in critical brain regions in the early stages of Alzheimer’s disease (bottom). Neurons are labeled with red. Why do some people remain mentally sharp over their entire lifetimes, while others develop devastating neurodegenerative diseases that destroy their minds and rob them of their memories? What factors protect the human brain as it ages? And can what we learn about those factors enable us to find ways of helping the millions of people at risk for Alzheimer’s disease and other forms of senile dementia? Those are just a few of the tough questions that Bruce Yankner, a 2010 recipient of the NIH Director’s Pioneer Award, has set out to answer by monitoring how gene activity in the brain’s prefrontal cortex (PFC) changes as we age. The PFC is the region of the brain involved in decision-making, abstract thinking, working memory, and many other higher cognitive functions; it is also among the regions hardest hit by Alzheimer’s disease.